I am seriously subpar at small talk. It seems my chitchats are simply devoid of all stimulating conversational aspects, and I can never come up with just the right question to get a good conversation going. Luckily, this winter has been the worst thing that has happened to me since braces, and most other Northwestern students feel the same way. The disgusting weather we’ve all been forced to suffer through provides the excellent topic for a chat before class. Unfortunately, aside from my complaints about the weather making small talk less painful, the wrath of Mother Nature that we’ve had to endure this season provides few benefits. At this point, it’s almost the end of February, and it feels like we’ve been polar vortex-ing and blizzard-ing ever since that one time GameDay came (yeah, this weather is probably Ohio State’s fault). Honestly, I think Mother Nature needs to take a chill pill and ease up a little on the extreme weather. Unfortunately, I have not yet found the weather machine that young Brenda Song used in “The Ultimate Christmas Present,” but I have found a way to protest the snow using Pinterest: snow paint. With just some water and food coloring, you can combat the fluffy white stuff that seems to inundate every square inch of the ground. To create the snow paint, just put a few drops of food coloring into a spray bottle filled with water. Shake the bottle and proceed to decorate the ground in whatever Picasso-esque manner you desire. The directions were relatively straightforward and yielded solid results. The snow paint created designs on the ground, and the colors were easily customizable if you recall the color wheel you mastered in third grade art class. The only drawback I found was how to operate a spray bottle. 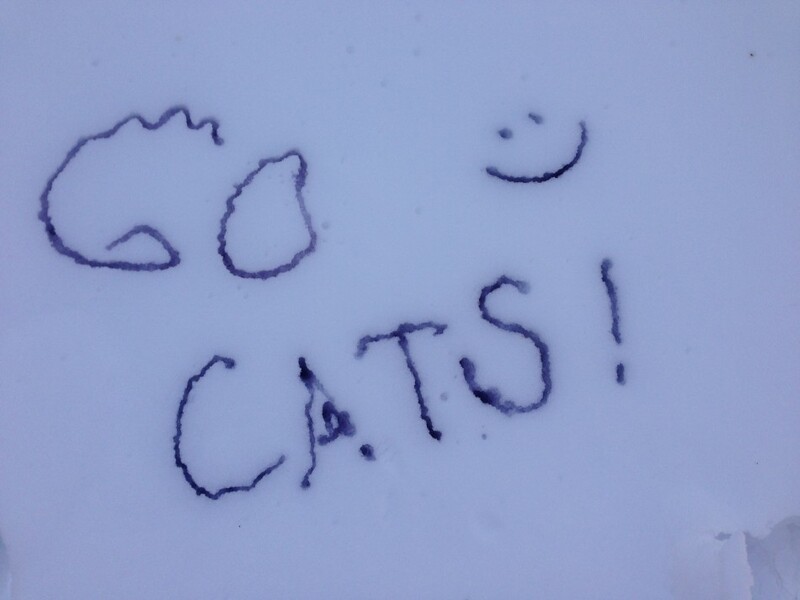 Every time I tried to use the paint, drops of color fell onto the snow and ruined my design. To combat this, I removed the lid of the spray bottle and poured the paint onto the ground into the pattern I wanted. This resulted in a more concentrated stream of color and turned out brighter in the snow. So, if, like me, you’re bored of seeing only white snow and dirty snow, I would recommend making snow paint. Not only does it spice up the monotony of evil winter, but it also provides a fun, creative outlet for your still-midterms-how-is-it-almost-finals stress.